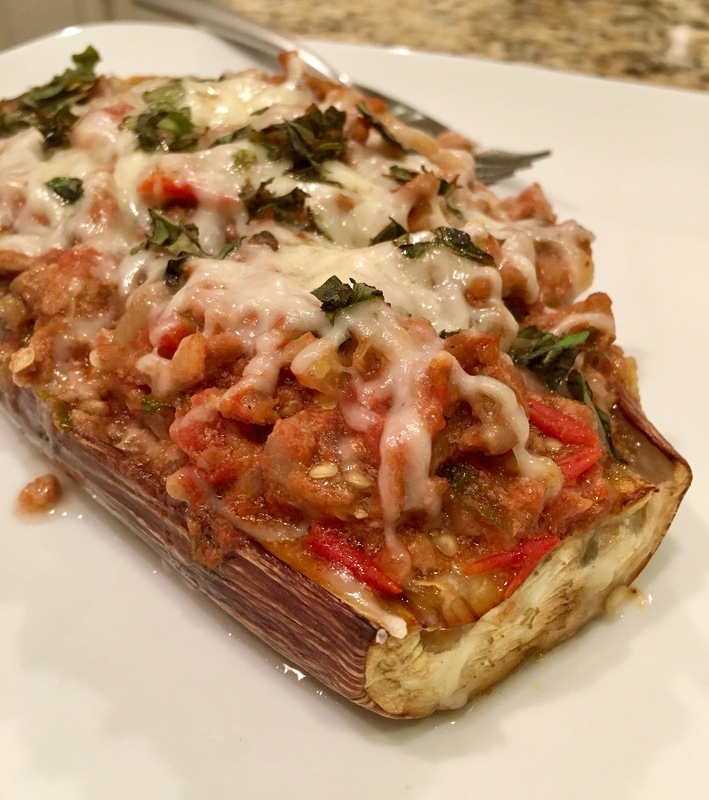 Stuffed Eggplant – Eat, Drink, and Go! Great take at the farmer’s market last weekend, I scored several bags filled with farm fresh produce. This included a nice big graffiti Eggplant. 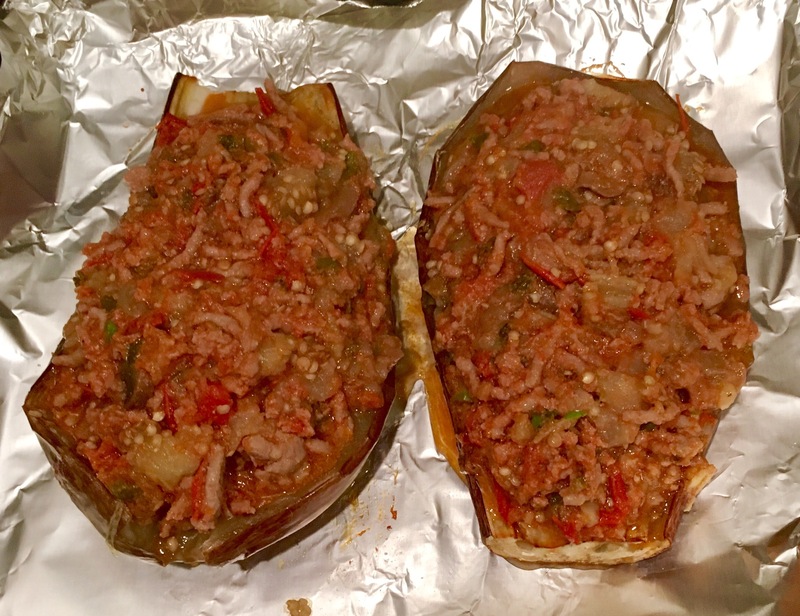 So naturally, stuffed Eggplant came to mind, stuffed with ground turkey, tomatoes, and Italian herbs. 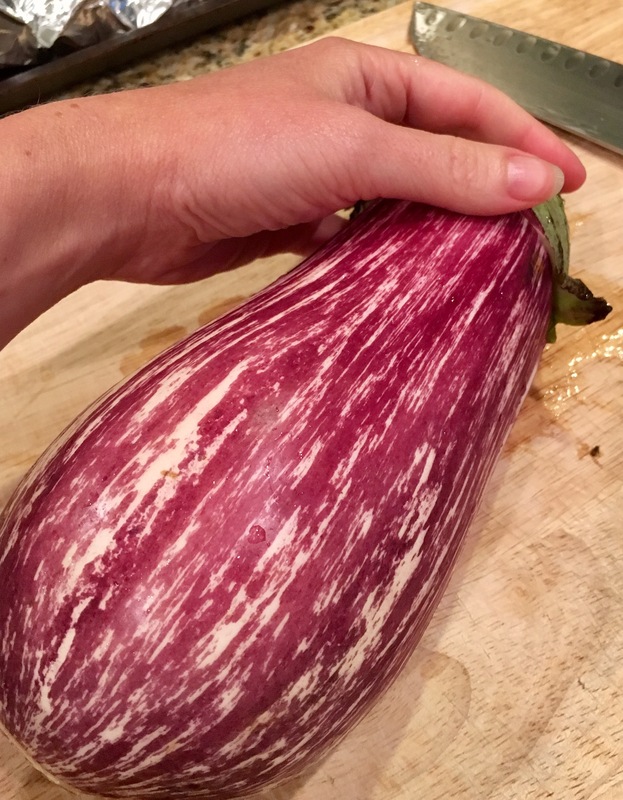 The striations on the graffiti eggplants are so pretty! 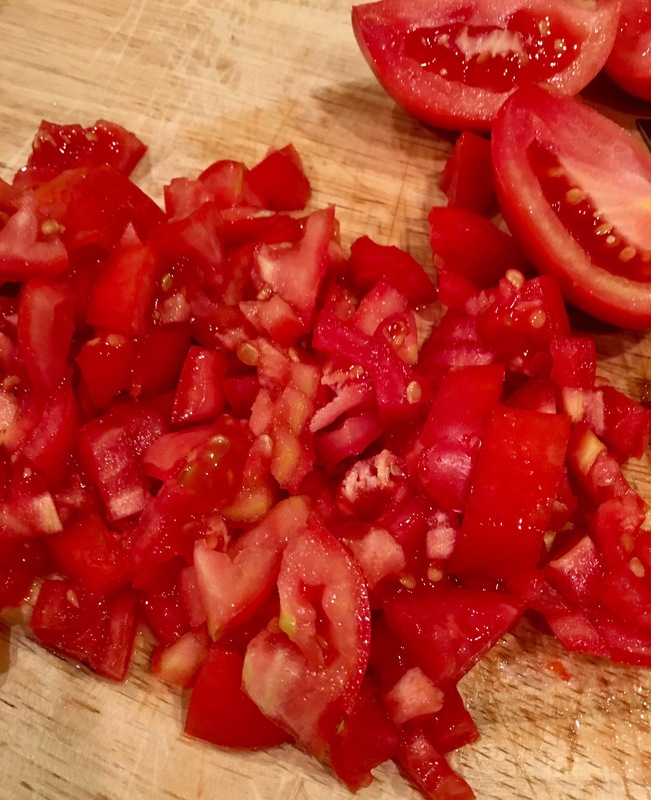 They don’t stay this vibrant when they cook, unfortunately, but it sure is pretty in the meantime. 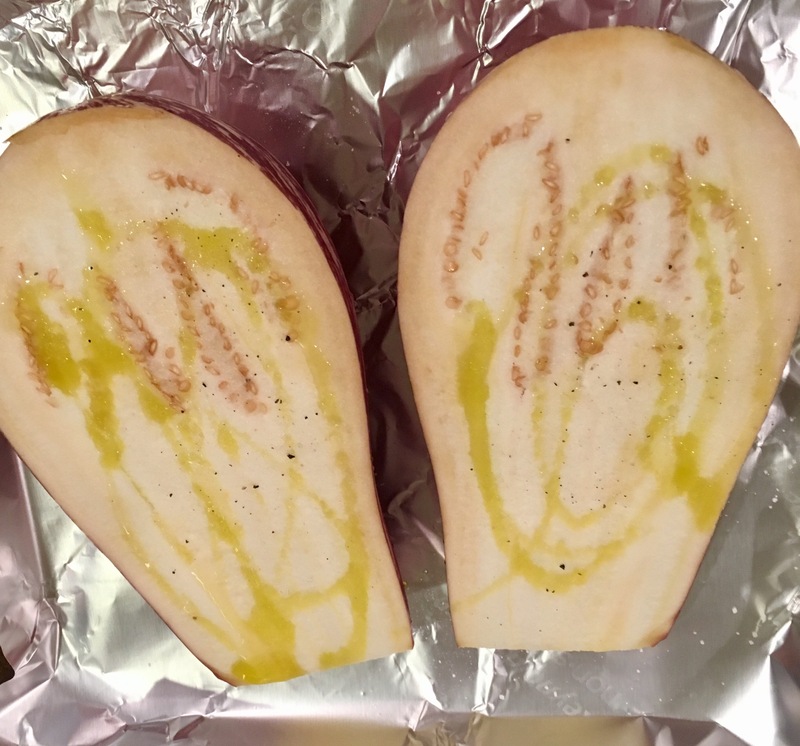 I sliced it in half and drizzled with Truffle oil, salt and pepper. 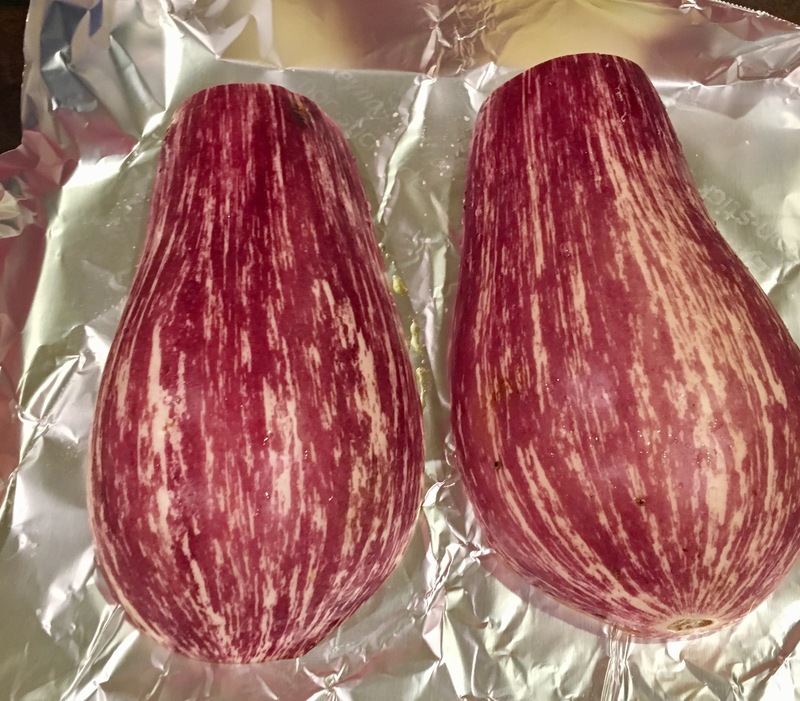 Then place the halves cut side down and roast on 400. 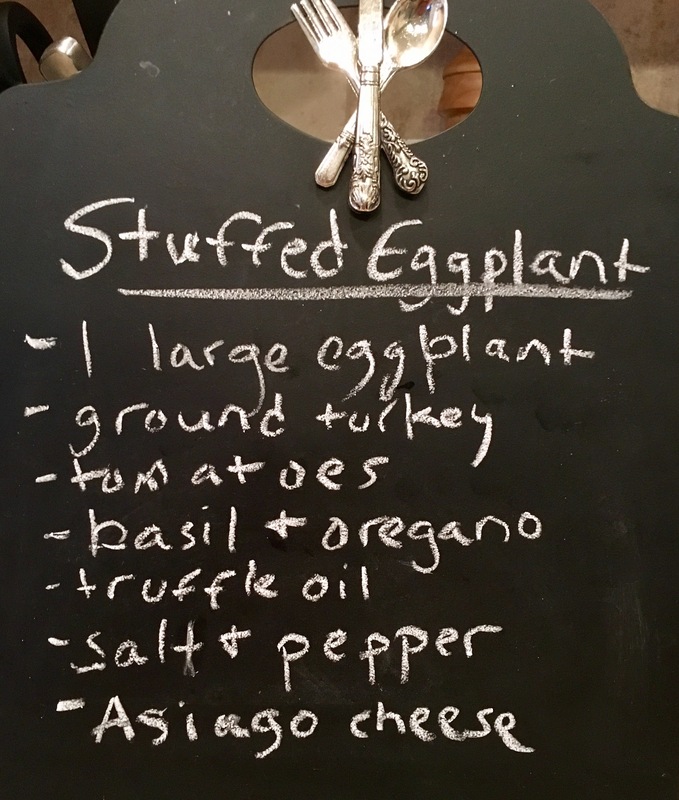 Takes about 25-30 min or so, enough to get your stuffing sauce going! 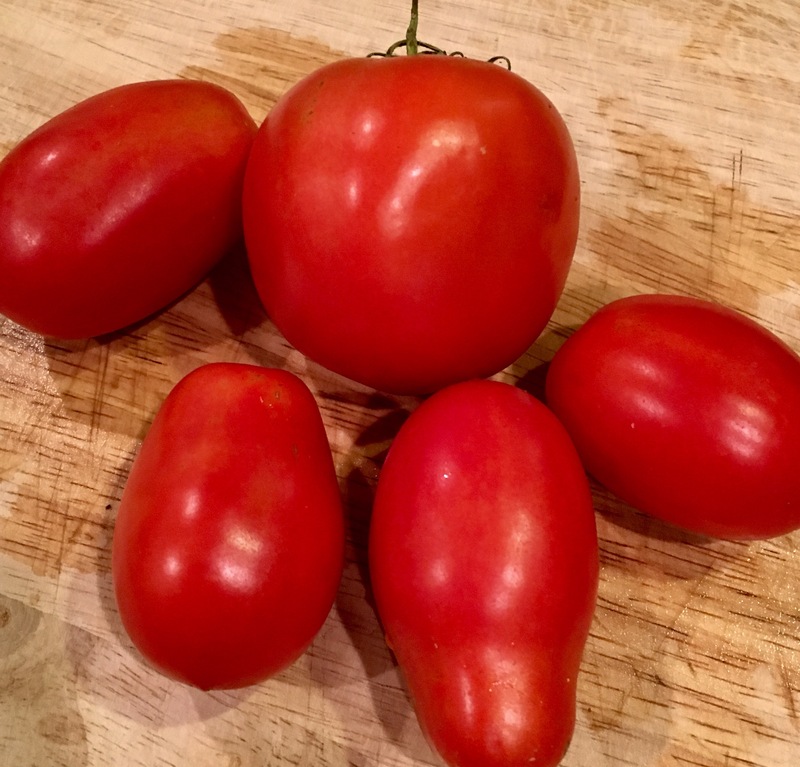 I picked a bunch of fresh tomatoes from the garden. 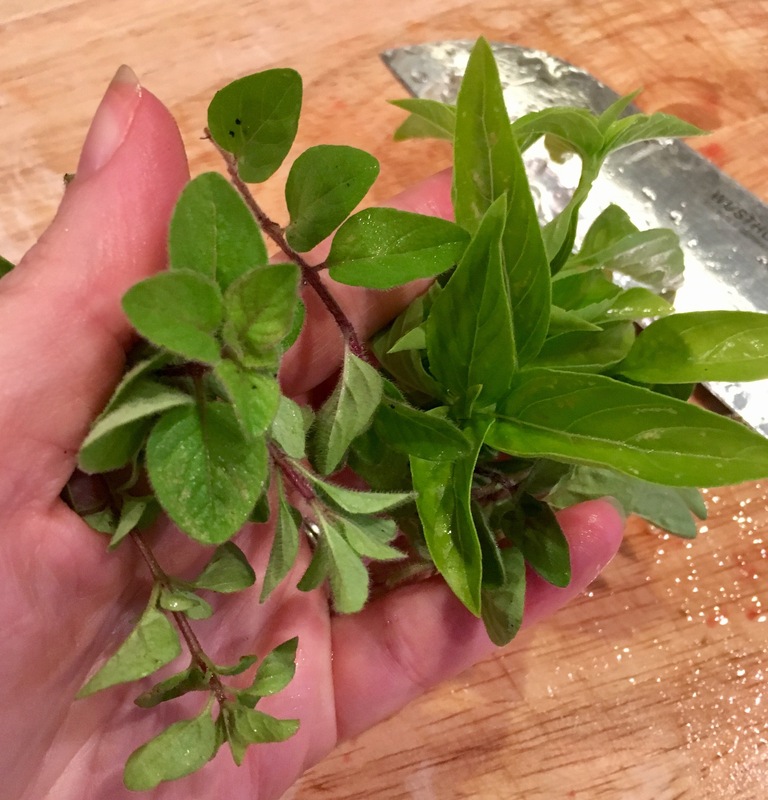 Diced em up and grabbed some fresh basil and oregano from my herb garden – it’s still alive! Amazing. 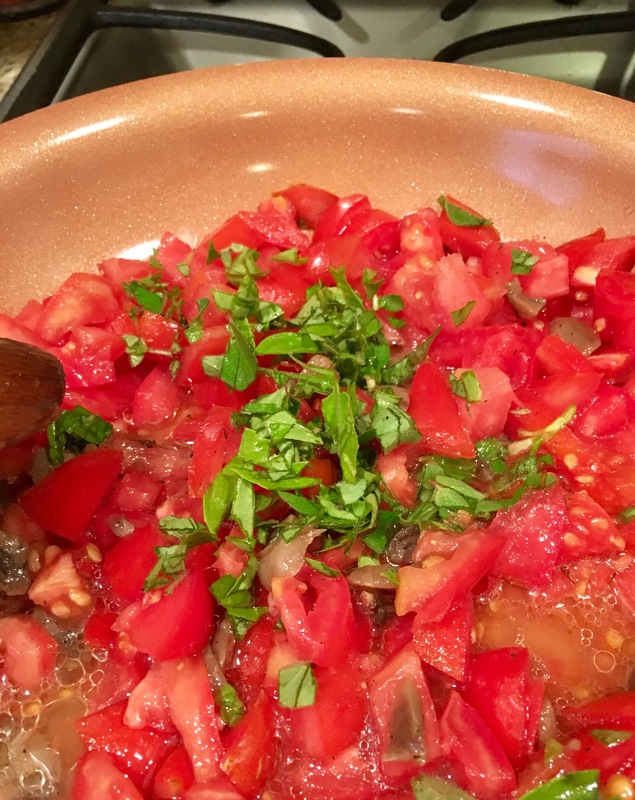 I tossed the tomatoes in a pan with some Truffle oil, along with about half of the fresh basil, and oregano that I chopped up. 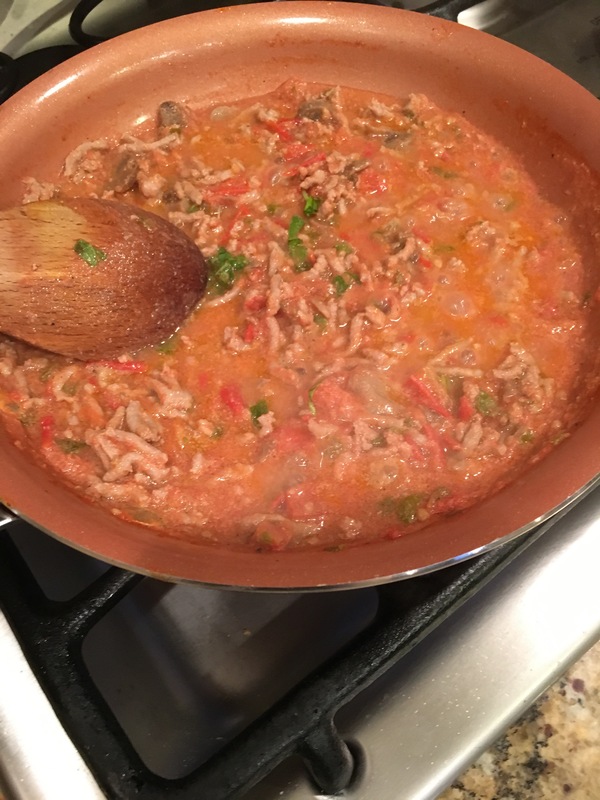 Get this all a bubbly and then add in the ground turkey, about a quarter pound. Mix in the turkey and add a little salt and pepper to taste. Simple yet satisfying. 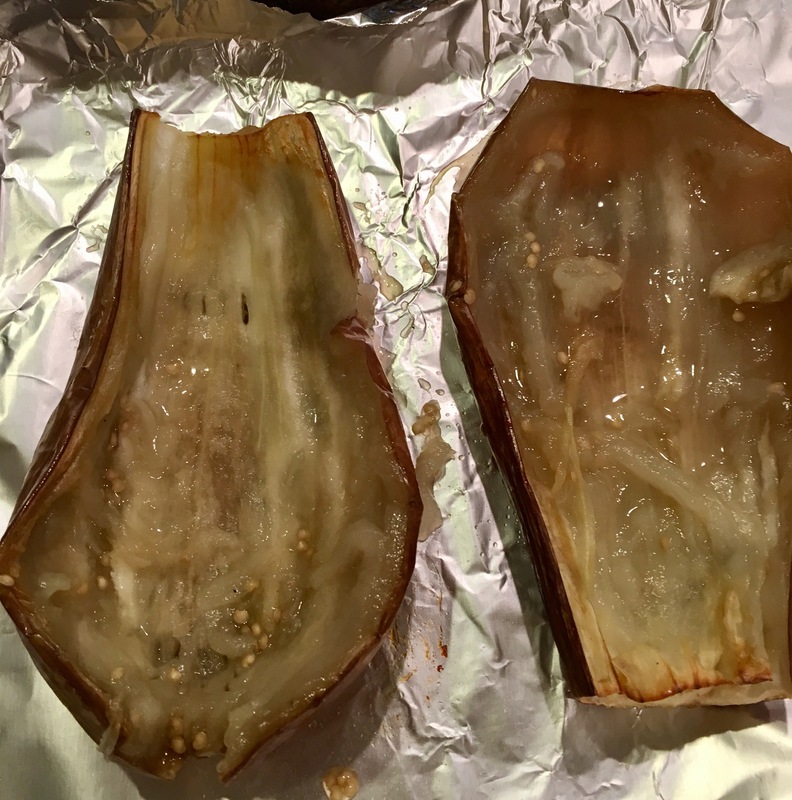 Let this cook down as the Eggplant finishes roasting. 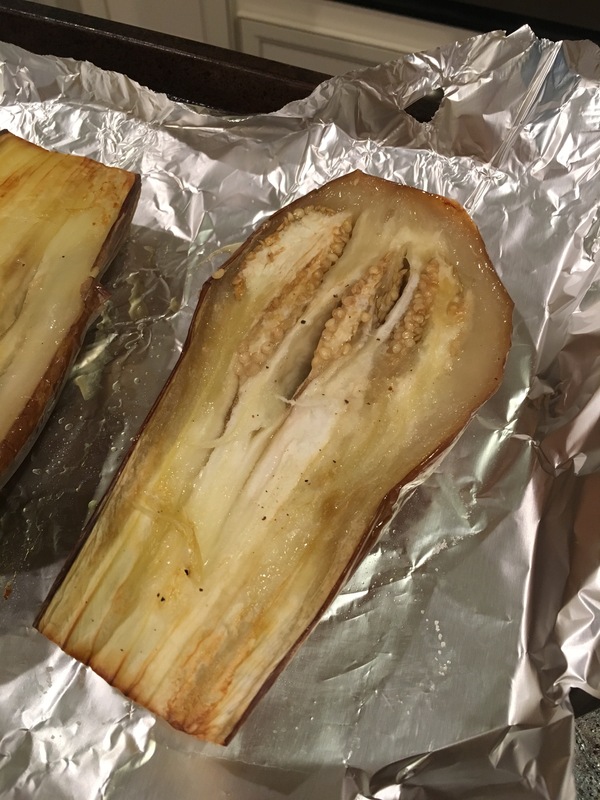 Eggplant is done when it’s browned and fork-tender. Now scoop out the insides, leaving some still in the shell to hold the shell in tact. 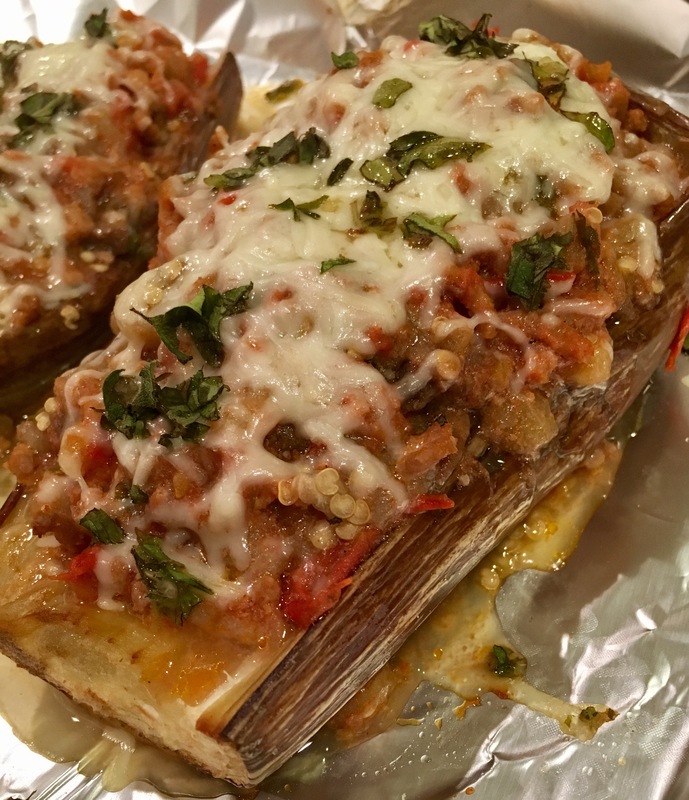 Chop up the insides of the Eggplant and add to your saucy sauce. 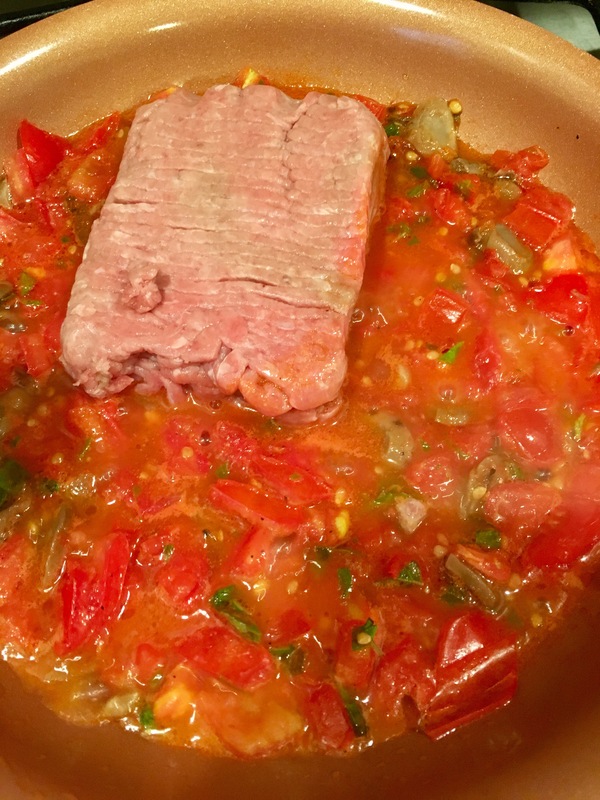 Trust me, it tastes better than it looks. 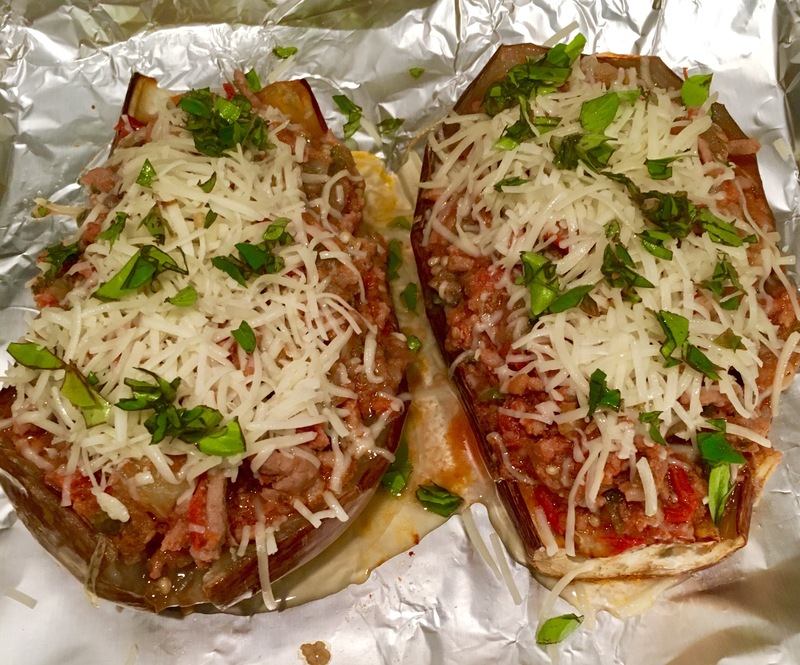 Mix it all around and cook a little more, then scoop it into the Eggplant shells. Add a nice spreading of shredded Asiago cheese and the rest of the fresh herbs on top as a blanket. Pop it back in the oven til the cheese gets melty good! Mmmmm. Now this made me happy. It came out just perfect. 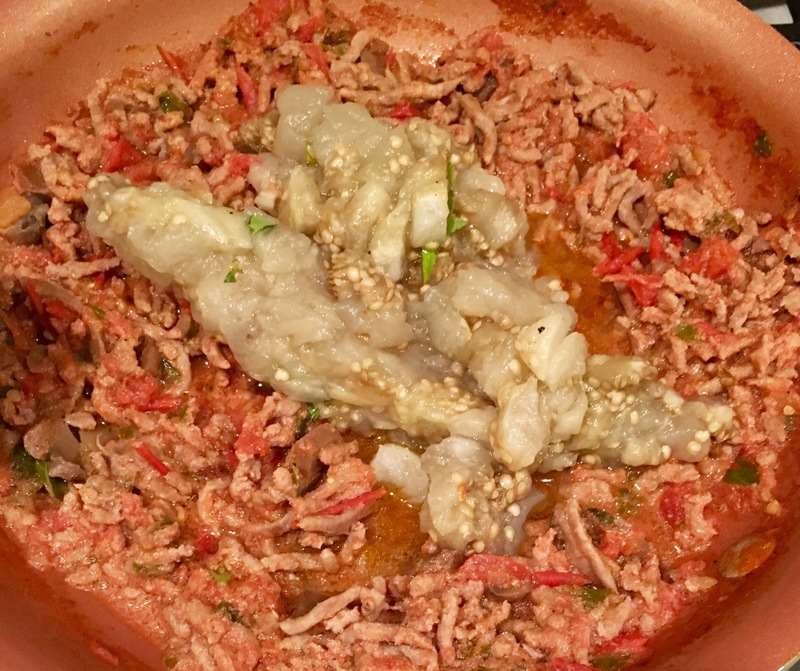 Soft, mild, gentle flavors that really satisfied the palette. 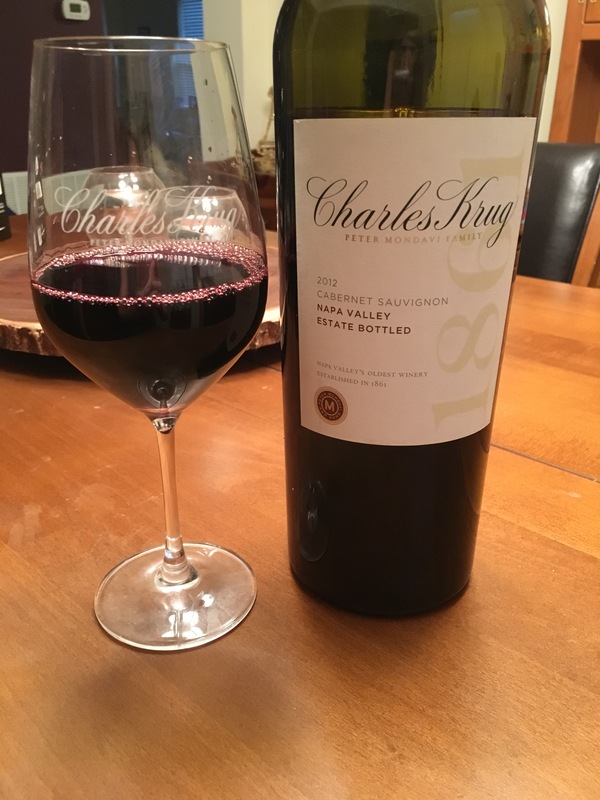 I opened a yummy bottle of 2012 Cabernet Sauvignon by Charles Krug. Don’t adjust your eyes. Not only is that a big red wine glass, but yes, it’s a big bottle – a magnum if you will – of deliciousness. 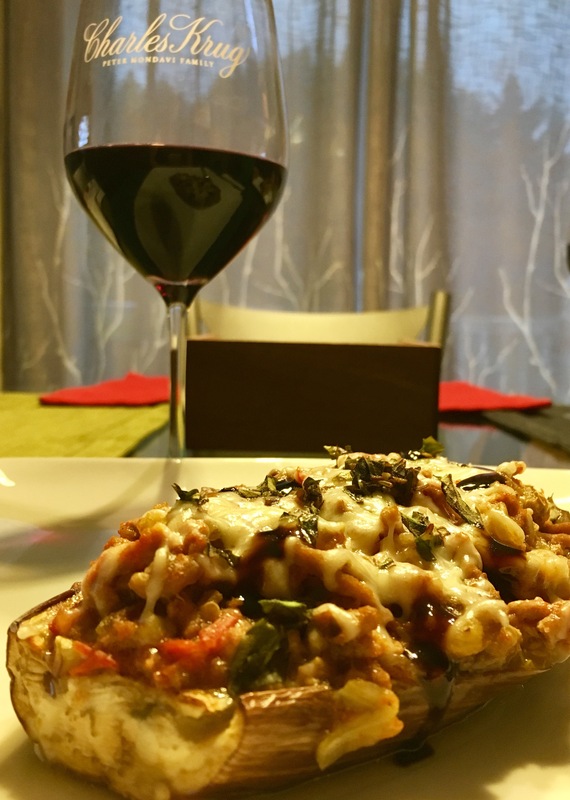 This velvety cab paired perfectly with the stuffed Eggplant.